The Backup step of the wizard is available if you have chosen to restore data from a backup file that resides in a remote location — in a network shared folder, on a backup repository or on a cloud repository. 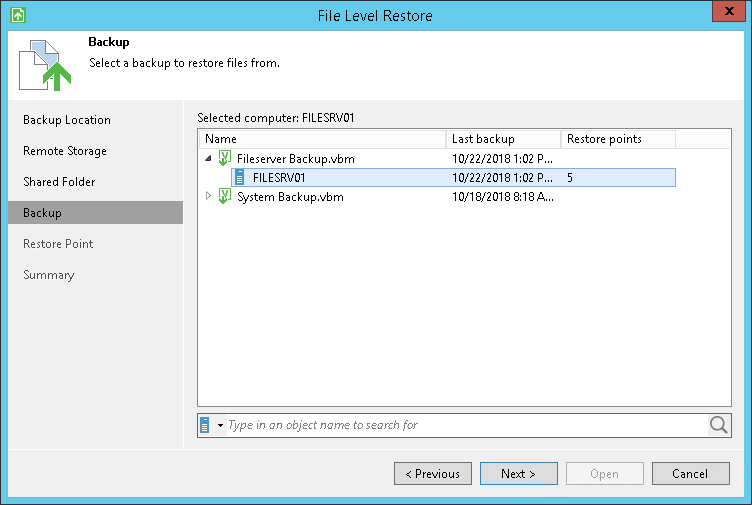 If you specify credentials for the user who is assigned the Backup Administrator or Restore Operator role on the backup server, the list of backups will include all Veeam Agent backups stored on the backup repository. If you specify credentials for the tenant account, the list of backups will include backups created by all users who create backups under this account. If you restore data from an encrypted backup that was created on another Veeam Agent computer, you need to provide a password to unlock the encrypted file. To learn more, see Restoring Data from Encrypted Backups.